Bollywood fashion could be extremely challenging to master. Some Bollywood stars had started on a wrong foot. Let us see which Bollywood diva has the best ever fashion makeover. Bollywood fashion is all about celebrity fashion designers and personal stylists. Gone are the days when stars would have to take care of everything on their own. Fortunately, with time Bollywood fashion scene has evolved and you would rarely spot a Bollywood diva in unflattering outfits or mismatch accessories. We however, have come across stars who never struck us as fashion queens, but much to our surprise and delight some of them have become style icons in their own rights thanks to their complete fashion makeover. Let’s find out who has actually, undergone the best possible fashion makeover. Though she was adorable and super cute right from the time she stepped into the Bollywood scene, her outfits were definitely not complementing her looks. Her outfits seemed to be a total disaster because they were outrageously colorful and had extravagant designs that did nothing much for her warm and vivacious personality. However, thanks to her competent personal stylists she has evolved as one of the most hot and stylish stars in Bollywood today. Her slender body is just right for any outfits from western wear to ethnic. She carries an Anarkali suit with equal élan as she does a western dress. She has mastered the art of creating an illusion of curves, while maintaining a perfectly petite look. Her immense popularity has been attracting designers of top order, who want her to model their creations. Today she has become a style statement and endorses anarkali suits online for reputed online sites. Today, Sonam Kapoor is a fashionista and is certainly one of the hottest stars thanks to her chic outfits and the way she carries herself with great style and ease. Everyone looks up to her for her dressing sense and superb choice of outfits. She has been constantly featuring in the best dressed lists of practically every red carpet or fashion show that she has attended so far. But if you ever come across her picture in her teenage days, you would be finding it difficult to even recognize her. She would be seen in gold headbands and matching hoop earrings that would give a completely going overboard and a bit tacky look. Her fashion sense seemed immensely boring. But luckily, she has come really a long way from those times and now we can’t help admiring her grace, style and super confidence in wearing classic western wear to super funky Indo-western fusions. She has been instrumental in popularizing the dhoti sarees designed by ace designer AnamikaKhanna. 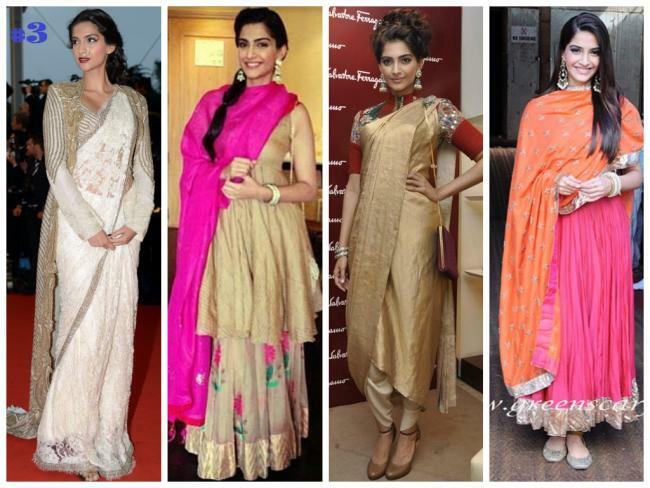 Whether it is a Chanel, Versace or our very own Sabhyasachi, Sonam carries them all with equal grace and style. She is undoubtedly, the style icon for the current generation. Kareena Kapoor Khan- It has not been such an easy affair for Kareena Kapoor to look absolutely amazing on red carpet or walk Lakme runways. If you go down the memory lane you would find a Kareena who had absolutely no idea how to dress up to look nice and fashionable. She would usually concentrate on wearing clothes that complemented her voluptuous figure then. But those figure-hugging tops did not do wonders to her appearance. After she lost weight and hired a personal stylist, Kareena is looking hot and sizzling in everything she is wearing. She is now all set to launch her exotic line of women’s clothing in collaboration with Globus, a reputed retail chain. Red carpet events, fashion degrees, and personal stylists have completely transformed these stars into certainly the best turned out Bollywood divas and style icons. Author Bio: Sujain Thomas is a USA based fashion critic specializing in Bollywood fashion. She is a passionate blogger. She loves buying exclusive Indian designer wear online and recommends Jomso.com to all her friends and followers. Next ArticleWhy Should You Prefer Tungsten Wedding Bands? Smokey Grey Eyes with Pink Lips – A Look You Must Try! This post is very nice. I love this post very much. I love to read more about Patiala salwar suit. IF possible then must share a post of how to dress up in Patiala Suits?